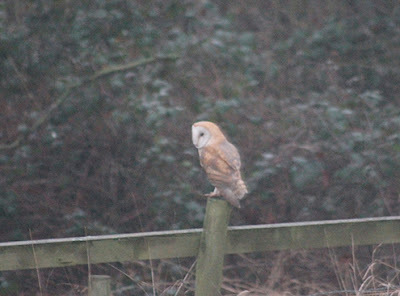 This year so far has been uber productive on the farm I am very pleased to say! The weather has had a huge part to play in this fact as it has been so very dry. The start of a year is usually cold and wet which limits me going onto the fields due to making a mess but this year was quite different from mid February onwards. This dry weather has enabled me to get on with jobs such as apple tree pruning, ditching, sorting out drains, fertiliser spreading and improving gateways. 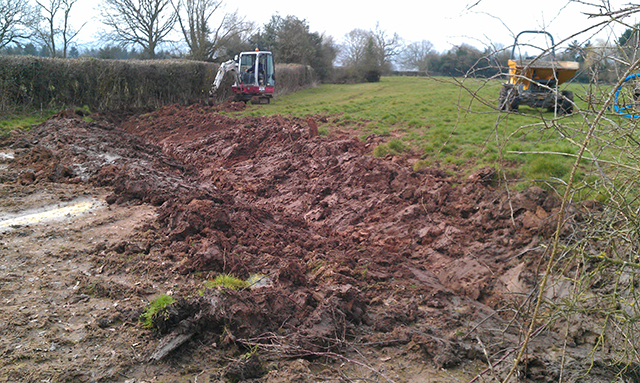 I have also got to say a big thank you to 'Dave' who has been an enormous help with his digger. The more I achieved the more I have wanted to do! 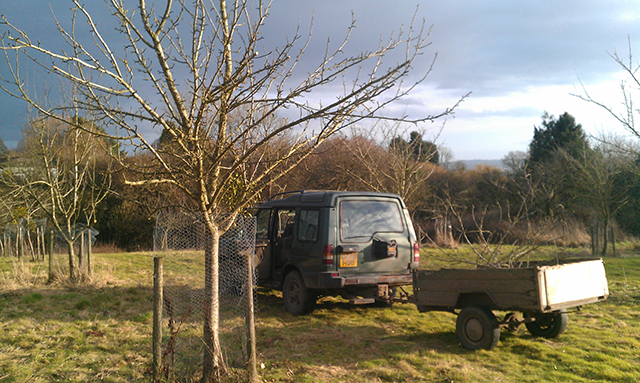 Managed to tidy up and prune both of our small orchards and I really enjoyed it! Pruning is quite a mellow job (if you are not on a ladder) and where to cut on a branch as well as the shaping of a tree is really quite fun! It is a little bit like being an artist and you step back every so often to see how it is all going. Lots of blossom in late May so I must have done something right! This was a good job done. Several gateways are 'pinchpoints' and 1 gateway can serve more than one field. With the cattle and tractors going though these gateways they had become impassable on foot in the wet weather so at long last we have addressed this (to a certain point). Do one gateway and drain it then moves the water on to another area... so a bit of ditching is then required and then you come across another gateway and you have now moved it the water situation onwards - you need to drain area! We have at least made a start and hopefully we can continue what we have started a little later on in the year. 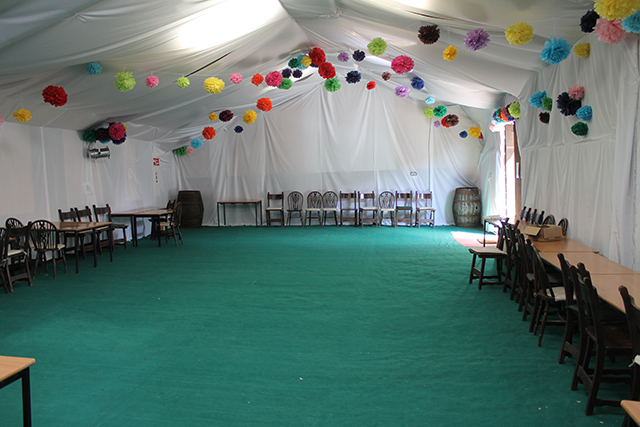 We have had three parties in the barn on the farm in May and June and they were a great success. Lovely people whose party it was each time and also the guests which all help the atmosphere and fun. 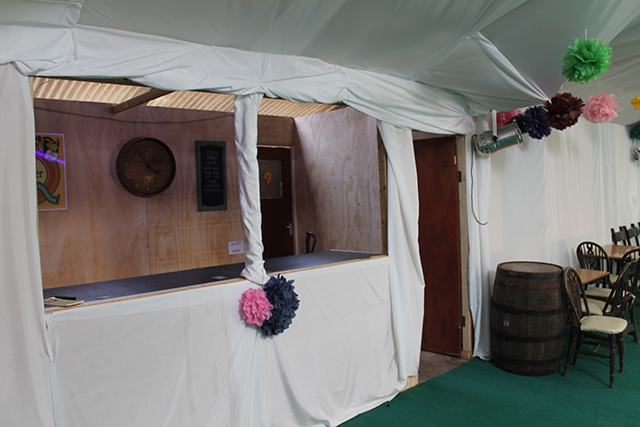 At last I have now constructed a proper bar area which worked very well for these events. When I first made the bar area I thought it it was way too big but by the time it is stocked up with drinks, glasses, fridge, bins etc and you have 2 people behind it frantically keeping thirsty guests refreshed it is actually just the right size! One party decorated the barn as if it was the inside of a marquee (see below) and it was very effective indeed and I still have all this material so this could be an option for parties in the future! I have also got some more lighting and even a laser for the barn which all helps the atmosphere. 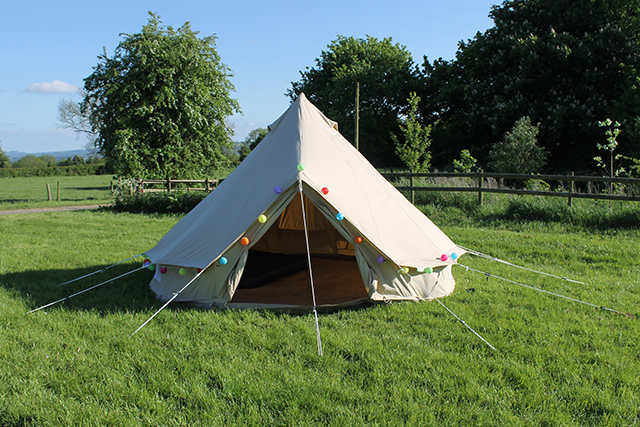 We have also purchased a new 4 metre Bell tent for the campsite. 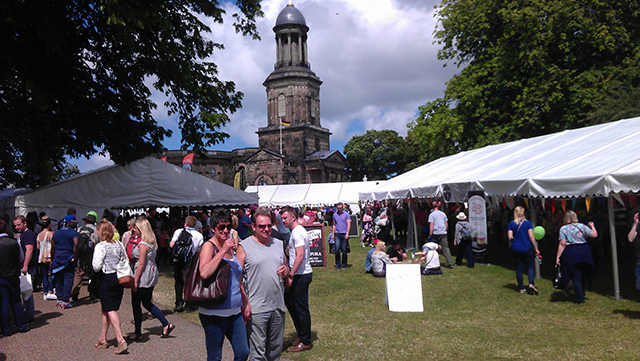 We have now started the Show season and The Shrewsbury Food and Drink Festival was unbelievable! Great weather, lots of people and excellent show organisation all added up to a spectacular event and we were very pleased with the weekend. We ran out of stock on the Saturday which was somewhat unexpected as we thought we had brought enough stock for the 2 days!! As I have mentioned previously we are doing less shows this year so the ones we do we hope work well for us. Oswestry Food and drink show is the next one on the calender. Some of you are aware that I got very excited in fixing up our old Series 2 Land Rover this year.... with the help of my mate Sion we were hoping to get it up and running in Springtime for a classic car event in Ludlow. Despite the very positive progress we have made over the months on it unfortunately the limiting factor has been time or more to the point - lack of time...(see above) Unfortunately it is STILL not done despite it being so very very close indeed to be finished... It is a shame as these balmy summer days we have been having it would have enormous fun. I am seriously thinking of towing it up to the local garage and getting them to finish it.... Something has to be done!! When it is finally done the world will know.... until it breaks down. AND we managed to go away for a week family on the Isles of Scilly! Wow! What a great place.. Had a great break and it was like being on a Greek island! White sand, Blue sea lots of little islands, gorgeous sunsets and the local supermarket was a crazy place! Blazing hot weather which resulted in minor sunburn - but it didn't matter as I was on holiday!! 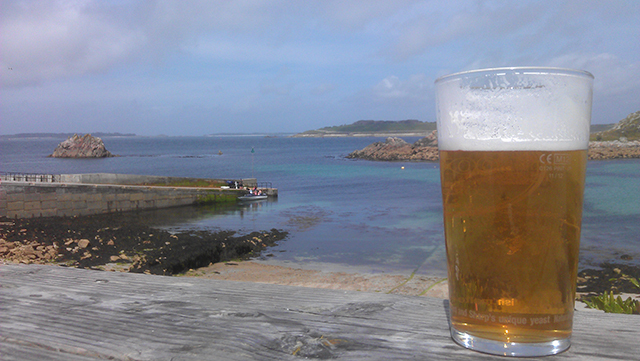 Enjoying an pint on the Isles of Scilly! Oh yes almost forgot... we are also half way through having an extension built onto the house.... Yes things have certainly been keeping Chris busy!